Last day of the Founders Tour! And what a great way to end it, too. Today I hopped in my father’s 1978 Corvette and we headed to the Gettysburg Battlefield Visitor’s Center. We were split into 2 groups to view a short film (produced by the History Channel and narrated by Morgan Freeman so of course, you need to go see it) and then the Cyclorama. Created in 1883 by French artist Paul Philippoteaux, it’s a 337 foot long, circular painting of the (in)famous battle. The Cyclorama underwent an extensive restoration project in 2008, and it’s well worth the ticket. Sorry, no photos allowed. After that, I spent a a bit of time in the museum, which is deceptively large, so I highly recommend leaving yourself a good 2 hours minimum if you’re a history buff and want to make an attempt at taking it all in. Afterwards, most of our group went on a driving tour of the battlefield. My father and I had a personal mission to find a gift for a friend, so we headed to the shops downtown. We plan on going back to the battlefield and purchasing an audio tour. Lunch was at Gettysburg Fire Company, and then we headed back to the hotel to prepare for the closing banquet. Special guests for the evening included AACA National President Tom Cox, and Pat Buckley from Headquarters who also put in a lot of hours helping Carol Barlup with registration. 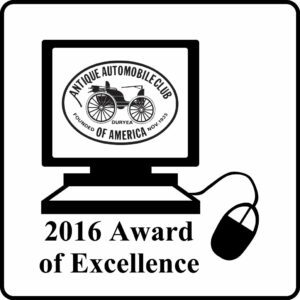 Also, Annette and Dan Yost were given an award from the AACA National Board of Directors for hosting a national tour. The banquet and thus the 2018 Founders Tour ended on a high note as Lynn Lech stepped up to the podium and gave a sneak peak at what’s in store for the 2018 Founders Tour. Well, it was a blast. And now I think we’ll all need a few days to recover, but the GRAACA can’t rest quite yet as we still have our Latimore Valley show tomorrow. Hope to see some of you Founders Tour people there! We only had one destination today: Rough & Tumble Engineers. Located in Kinzers, PA, Rough and Tumble Engineers Historical Association is a uniquely interactive museum. Located on 33 acres, the exhibit is full of various kinds of historical equipment which isn’t left around to collect dust as all of it still works! The best time to see R&T is during a show when the members and their equipment are all revved up, so we certainly got a treat on this gorgeous day. I was told that they extended their Friday and Saturday show one day just because they knew we were coming. Some of the sights we got to enjoy were blacksmith demonstrations at the forge, a 1912 shingle mill in full swing, and even a saw mill. They also had the Little Toot and Shay Railroads fired up. I shamelessly took 2 rides on the Shay around the premise. One final thing I almost forgot: I got to ride with my grandfather in his 1966 Plymouth Fury! I haven’t been able to travel with him this week as the convertible has been full of other passengers, but today it felt a lot like old times. Change of pace for the day: I got sit in the driver’s seat! 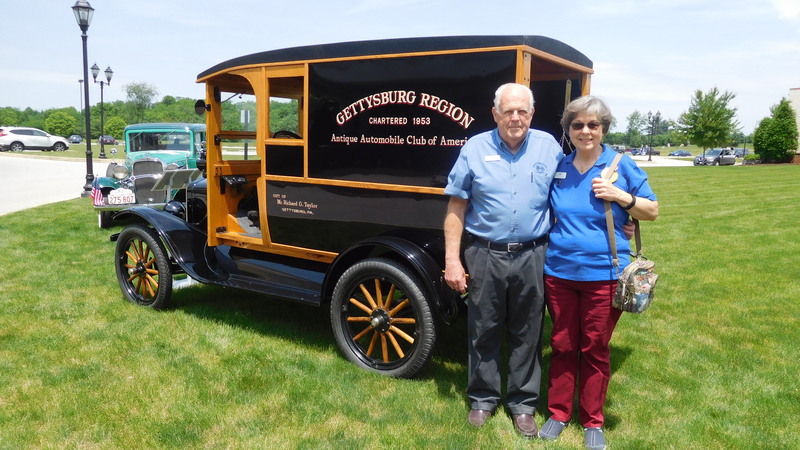 Josef and Nora Puskas, a lovely couple from western Pennsylvania, found themselves without a driver as their son Stephen was feeling a bit under the weather. So, I played chauffeur in a 1970s Toyota Corolla and had a blast. The weather stayed rather bleak and dreary long into the afternoon despite the forecast, but nobody seemed too deterred by a few raindrops. Our first stop for the day was at Tressler’s Garage in New Bloomfield. 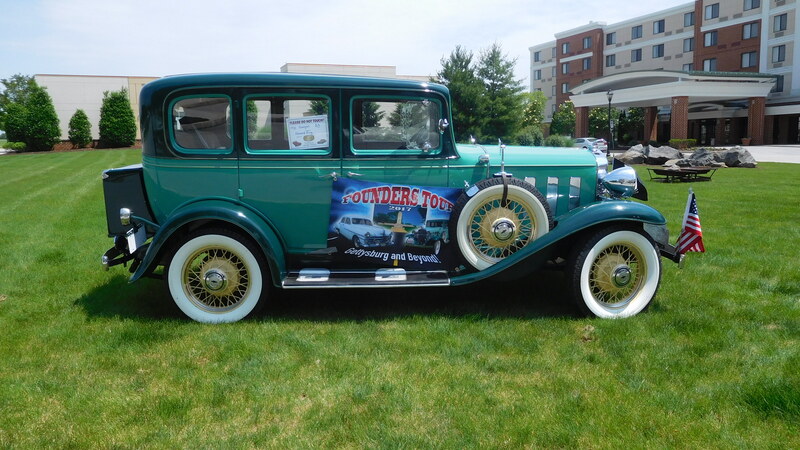 Built in 1926 and is currently owned by Don and Carol Barlup of our Gettysburg Region. They were kind enough to open it up for us and show off some of their cars and collectibles while we enjoyed a variety of donuts and danishes. From there, we enjoyed a leisurely driving tour through Perry County to see several covered bridges which have survived since the 1800’s. Most of my pictures were snapped through the windshield of the car, but we finally came across one where I could pull over so Josef and I could step out and get a closer look. After about 2 hours of winding our way along twisty-turny back roads, we arrived at Blain Fairgrounds for a (very) hot lunch — the chicken corn soup was delicious but I’m pretty sure it was still boiling in my cup when I went to take a bite. Although the fairgrounds was our last official stop for the day, the route back took us up to the top of the mountain at an elevation of 1,476 feet. I’m sure that the mountain has a breathtaking view of Cumberland Valley below, but we couldn’t see it for the clouds. Oh well. Guess what I got to ride in today? The sidecar of a Russian-made Ural motorcycle! Driving was Brian Davis, one of our volunteer parkers for the week, but he happened to have the day off to actually go on the tour. Lucky for both of us! Our first stop for coffee and donuts was at the Fort Ritchie community center. It’s quite a large facility and the locals seem to love it. Several exercise classes were going on while we were there. After getting a much needed caffeine boost, we were off to the Agriculture Education Center and Rural Heritage Museum in Boonsboro, Maryland. If you’ve never been there before, you need to go and plan to spend the day. They have several museum buildings crammed full of exhibits including tractors, buggies, children’s toys, plows, a Conestoga wagon… you name it. There are also several 19th century buildings on the premise including a church, country store, and school house. These buildings were “rescued” over time from the surrounding areas by being torn down and then completely rebuilt at the center. Out back is the Rural Heritage Village Homestead made up of two long homes, an outdoor drying shed, windmill, and brick wood fired bread oven. Every building was open that day and had a volunteer guide to answer any questions. Some people on the tour were enjoying themselves so much that they asked if they could stay longer instead of heading out around 12:30 as the tour book recommended. Of course they could! I’m sure that the volunteers at the center appreciated that kind of enthusiasm. I know our tour planner Annette Yost was ecstatic. Brian and I left around 1:30 to make it to our final stop for the day: Renfrew Museum & Park. The park is quite extensive and is the sight of the 200 year old Royer-Nicodemus farmstead. They too had pulled out all the stops for our arrival. Volunteers in period dress offered tours and demonstrations at the various buildings. There was even a fire burning in the summer kitchen. Check out their Facebook page to see video of some of our cars arriving at the park. Today was the first official day of the Founders Tour and already I’m exhausted! But in a good way. I should start off by saying that I’m a bit of a gypsy this week as I didn’t bring a car. Instead, I’m hitching rides with whomever has an empty seat. This morning I was extremely fortunate to get a lift from Monday’s tour planner Jerry Black who’s driving a very comfortable 1948 Plymouth. This proved very convenient as Jerry already had the route memorized, so I didn’t need to navigate, leaving me free to gawk out the window at the beautiful scenery. Our first stop was at Laurel Lake, part of Pine Grove Furnace State Park for a coffee stop. Along the way I marveled at the forests full of mountain laurel in peak bloom. It was a leisurely drive on winding roads through the mountains. From there, we headed to Meadowbrooke Gourds. I had see their beautifully crafted gourds in stores around Gettysburg before, but I certainly gained a new appreciation for their products after going on a tour of the factory. Each little gourd is a work of art, painstakingly crafted by hand by dedicated and highly skilled employees who truly seem to love their jobs. After that, we were off to lunch at the Penn Township Fire Hall for some Pennsylvania Dutch pot pie. A round of applause should be given to the ladies in the kitchen who worked so hard to feed us all. The food was delicious! By this time the rain clouds had rolled in, but it never got worse than a steady drizzle for a few hours, and it certainly didn’t seem to deter anyone from getting ice cream when we arrived at our final stop: the U.S. Army Heritage Education Center. It’s a wonderful museum currently with indoor exhibits on the end of WWI, the Soldier Experience throughout history, the War on Terror. It also has multiple outdoor exhibits stretched out over a mile long walking trail. Yes, a few souls braved the rain and walked the entire trail (I only made it about half way). It was a long day, but lots of fun, and I can’t wait to see what’s in store tomorrow! What a great way to kick off the 2017 Founders Tour! Registration started around 10 a.m. and the table stayed busy as tour members from 22 states and even Canada lined up to get their information packets and goody bags full of cool giveaways. The hospitality room was also a hot spot of activity. Tables were full of all kinds of delicious things to eat. Lined up along the main wall were fantastic items for the Chinese Auction which will continue until the final drawing on Friday. Also in the room can be found Gettysburg Region merchandise to show off your pride, as well as fun games to play in the evenings. Many thanks are due to Bob & Martha Channell for taking charge of set-up and to everyone who helped out with organizing the room and bringing snacks (Pat Shaffer, Annette Yost, Dottie Schultz, John Wolf, Bill Seely… apologies to anyone I forgot)! 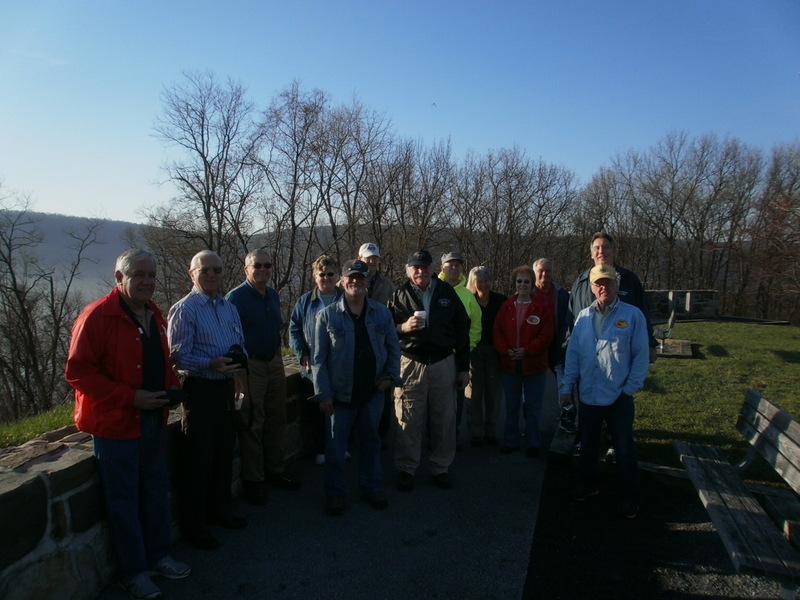 Later in the day, tour members were given directions for several Early Bird tours. Your Webmaster decided to go to New Oxford to see the Train Station Museum. Run by the Conewago Valley Rail Club, it’s a lovely little treasure right on Lincoln Way. Just look for the bright red caboose! My father and I got an insightful tour by the Gettysburg Region’s very own Fred Gable. Fred’s knowledge of railroads and locomotives is nothing short of amazing. And to top it all off, the experience was very interactive: we got to ring bells, play with the dinner chimes, and then Fred demonstrated how the station signals and whistles worked. Not to mention that they even fired up the model train board. It’s a wonderful place to go if you have kids, or if you qualify as a big kid, which I guess I do. The day concluded back at the Wyndham which Chris King organized. She and Martha Channell also designed the clever table toppers of Civil War caps, flags, belt buckles, and canon balls. The banquet hall was packed full, and apart from the scrumptious sandwiches and wings, attendees were treated to a special appearance by Ulysses S. and Julia Grant (thanks once again Bob & Martha!!). The first day of the 2017 Founders Tour! Registration : After checking into your hotel room or settling in at the campground, be sure to stop by the Registration table at the Wyndham. You’ll receive your tour book, window cling, and goody bag full of cool stuff like brochures, maps, and coupons. Hospitality Room : You’ll be able to pick up a T-shirt if your ordered one and grab some snacks. 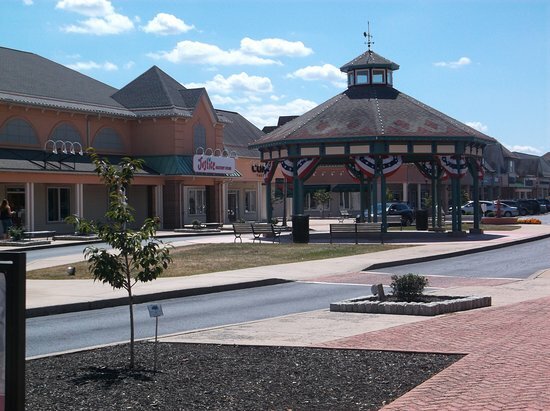 Gettysburg Outlets — Great for shopping and getting a bite to eat at the food court. 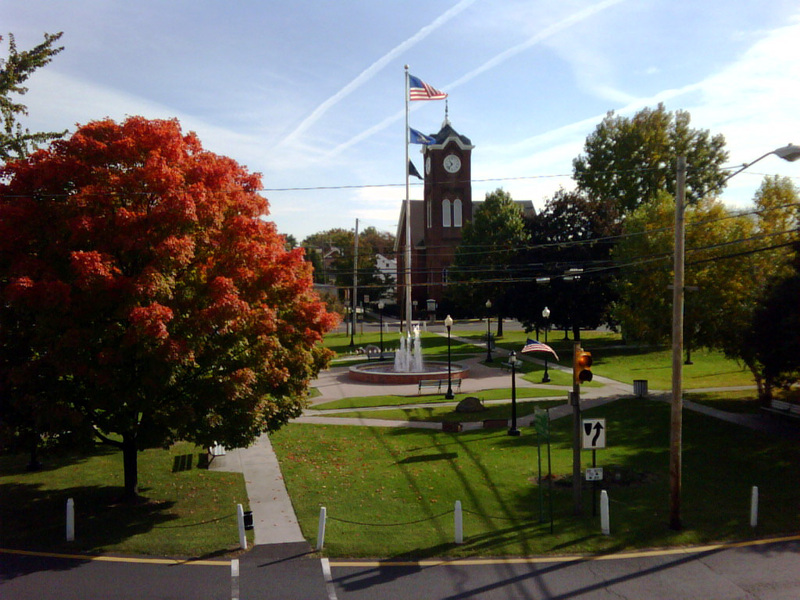 New Oxford — A wonderful town for people who love antique shops. 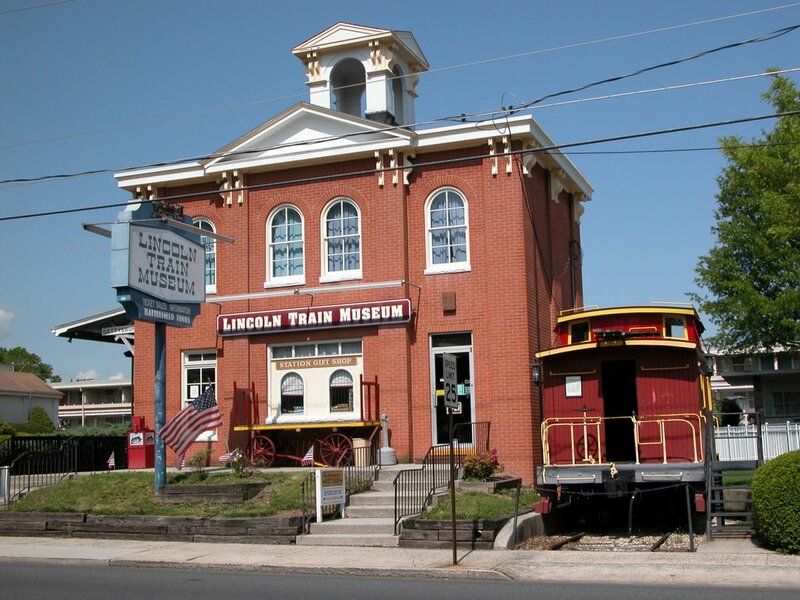 Lincoln Train Museum — Near downtown Gettysburg, this museum offers a unique look at American history. A coupon for admission is in your bag. Can’t make it on Sunday? 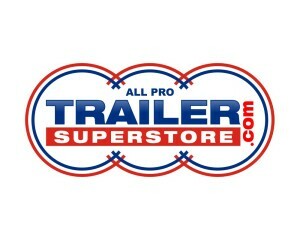 Your coupon is good for 1 year!! Welcome Banquet : Finish the day back at the Wyndham at 5:30 for a buffet dinner. Once again, the AACA held its Annual Meeting in Philadelphia at the Sheraton Hotel from February 9th – 11th. However, Gettysburg Region members got to experience one slight change, as we had our own booth at the trade show! That’s right. The 2017 Founders Tour is creeping closer, and closer. So, to get the word out about what we all know is going to be a fabulous week, our Tour Chair and Co-chair, Howard King and Annette Yost showed up early on Thursday to set up. With our banner hanging high, visitors to the booth got to view a slideshow highlighting some of the tour’s events, ask questions, take a brochure on the tour or a flyer about the Latimore Valley show, or maybe just grab a piece of candy (always a good “hook”). Also, thanks to Destination Gettysburg, we held a drawing for a signed print of the historic Gettysburg train station. It was a huge hit, and we would like to congratulate Linda MacFarland who got to take this beautiful work of art home. By the time Saturday afternoon rolled around, so many people had stopped by the booth that every single brochure was gone! Lots of folks seemed extremely enthusiastic about all that we have planned, and some have already booked their hotel room. 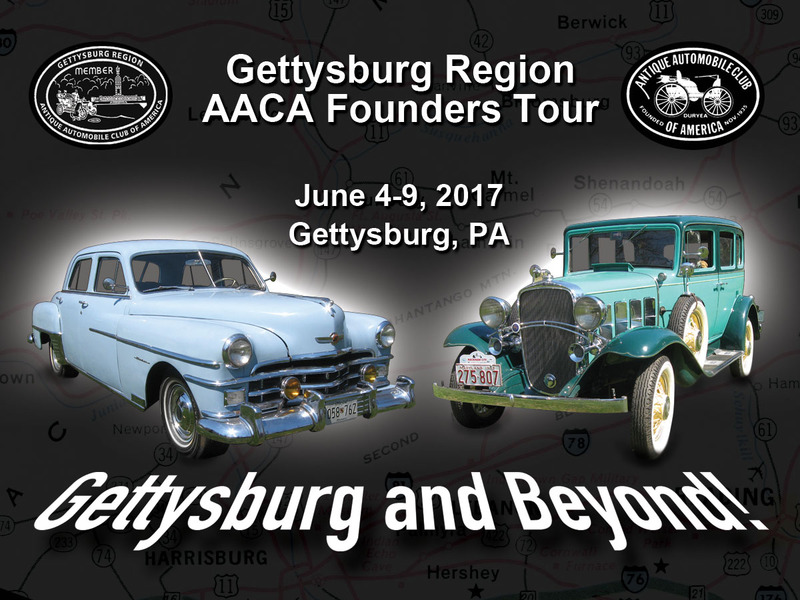 If you happen to be one of these eager beavers, please make sure you send in your request for registration information to the AACA National Headquarters as soon as possible. Some registration packets have already been sent out. We have 150 spaces to fill.